American Express Co. (AXP) was mentioned last night in Jim Cramer's Mad Money program on CNBC. Cramer noted that the "markets are a coiled spring, ready to roar higher on any good news, while shrugging off the bad. In fact, the stock market has become a lot more resilient than even the bulls were predicting, given how things looked just a few short weeks ago." Keep those thoughts in mind as we look at the charts and indicators of AXP which is rallying from a lower opening. In this daily bar chart of AXP, below, we can see a rally from a February low to an early December zenith. 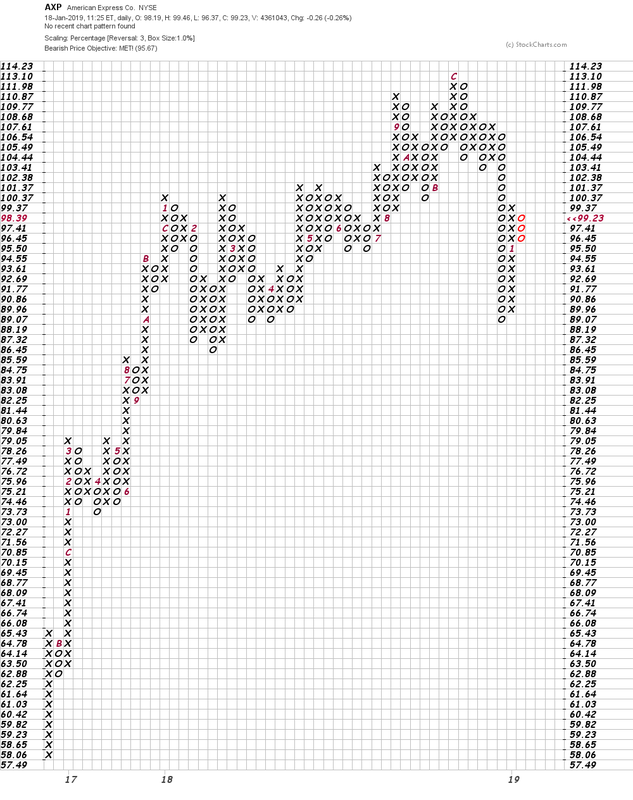 Without a bearish top pattern AXP sold off quickly in December but has since rebounded. The declining On-Balance-Volume (OBV) line from September gave us a heads up that sellers had become more aggressive before the price peak. The OBV line has turned up from late December and could be showing us the way higher. The Moving Average Convergence Divergence (MACD) oscillator crossed earlier this month to generate a cover shorts buy signal. Now look at the 200-day moving average line -- notice how it acted as support several times in the past year. The 200-day line intersects around $102 and could be tested in the days ahead. This line could provide resistance but if it does not generate selling I would treat that as a very bullish signal. In this weekly bar chart of AXP, below, we can see that prices maintained a strong uptrend for much of the past three years. Prices broke below the rising 40-week moving average line and now that line intersects around $103 or so. A close back above $103 will inspire the bulls. The weekly OBV line has been rising the past three years and it only shows a slight dip recently. The weekly MACD oscillator is narrowing to a possible crossover and buy signal. In this Point and Figure chart of AXP, below, we can see that a downside price target was met and that a trade at $100.37 will be a short-term positive. Bottom line strategy: AXP is rebounding nicely and I think it can surprise on the upside. Aggressive traders can buy on strength over $100.37 and $103. Risk a move back under $94.